We proudly present: WHO IS THE Q MAN? 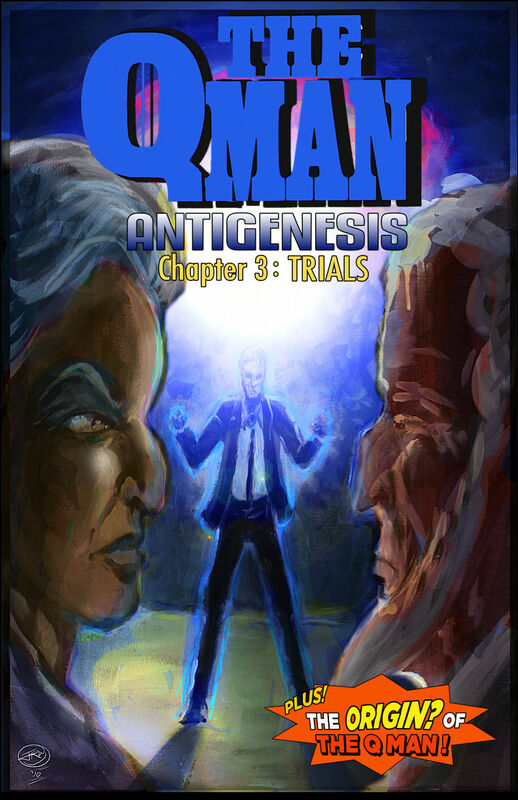 A serial graphic novel by Aaron F. Schnore and J. Robinson Wheeler. JRW Digital Media provides freelance illustration and digital comics production (consultation, templates, lettering, coloring, digital prints) for a diverse range of clients and publications. ACX: Academy X (Issues #01 thru #06). Written and Edited by Adam Cadre. Max Blaster and Doris de Lightning Against the Parrot Creatures of Venus (Poster art). Written and Programmed by Dan Shiovitz and Emily Short. The Unprotected (Issue #01). Produced and Published by Application Security, Inc.
Dragon in the Snow – A Sid Friedman Adventure! (Back cover) Written and Published by Forrest Dylan Bryant.